Creative Suite 3 Launch - March 27, 2007, @ 3:30 p.m. Eastern time - Watch it live! Submitted by admin on Mon, 2017-09-18 08:46. The schedule for WordCamp Birmingham has just been released! Check out the amazing group of Speakers and Sessions we have for October 21 and 22. 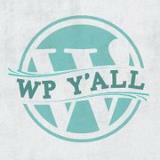 Just $40 gets you admission both days, a snazzy WP Y'all t-shirt, lunch Saturday and snacks both days.